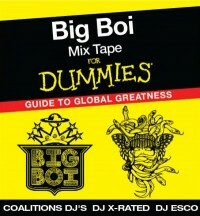 The first ~20 tracks are classic Big Boi tracks, while a few of the later tracks sound like tracks that didn’t make the cut on Sir Lucious Left Foot: The Son of Chico Dusty (read: unreleased Big Boi tracks). One of my buddies, let’s call him Montizzle, lives in Savannah (SEA PORT!) and was at the club when they filmed the video. He found out about it through the buzz in Savannah about Big Boi’s new album and also since he frequents The Jinx (where it was filmed) every Thursday night to dance. He thought they would be filming the video earlier in the night, but when he got to the club around ten, they were getting set up for the video. They held everyone outside until Big Boi got there at 11ish. The scene was a lot of Savannah SCAD (Savannah College of Art and Design) kids, wasn’t too much of a Hip-Hop vibe there. When Big Boi and Vonnegutt had both arrived, they started playing the song… then again… then again ’til they got all the footage they needed for the video. When Montizzle heard the beat drop, he knew the album would be hot. The SCAD kids were even bouncing up and down for a Big Boi song! Hit the jump for Big Boi quotes! Andre 3000 Covering a Beatles Tune? Whaddayou think of this Andre 3000 ditty? Sounds like it was going on the Class of 3000 soundtrack.